My name is Henriëtte Hofman I am enrolled in the Asian Studies Research Master. In this programme, students get the chance to go abroad for one semester to do research for their thesis. My research is about “the Manchus”, a people from the north-east of Asia who conquered China in 1644 and ruled over their Qing empire until 1912. After 1912, however, many Manchus gave up their culture and language due to heavy discrimination. Manchu studies therefore became a field about the past. Until now. More and more Manchus are starting to develop an interest in their ancestors’ language and culture, and therefore start learning about it. My Manchu Teacher at Leiden University (Fresco Sam-sin) told me about the “Hebei Normal University for Nationalities” (河北民族师范学院) in Chengde (承德), which lies just about 300 kilometers north of Beijing. An old classmate of his, Wanggiyan Sure, is teaching Manchu in a new fashion. Instead of teaching it like a dead language, translating old texts, Sure prefers to teach people to actually speak, write, listen and read Manchu. I was immediately super enthusiastic about this, and decided to take a look. Of course the main reason for my stay at this university is doing research about these modern Manchus. But I could not bear not to dive into this “modern” way of studying Manchu myself. Through this blog I will keep you updated on my experiences here in the far, far east. I will describe the classes I am attending, my daily life here, my research project, and many more interesting things. For now I will shortly describe the university itself. The day I arrived here, everyone, including the teachers, pardoned themselves for being a “normal”, or even a “bad” university. In China you cannot go to any university you want. The score at your final exams in high school (高考，gaokao) determines to which university you can go. Universities like Peking University are the dream of every kid in high school, but only a handful makes it to that heavenly resort. This university is not as highly praised as Peking University. Still, from what I have seen now, the classes here are not much different than any other university I have seen, and the dormitories, buildings and library are also just like all the others. This university simply does not get as much subsidy as “better” universities, and that’s why, for example, the WiFi has been dead for almost a week now. Hebei Normal University for Nationalities is actually a really bad translation of 河北民族师范学院. The Chinese name clearly describes the aim of this university: training new teachers (see 师范, shifan, in the name). 民族, minzu, which means “ethnic minority”, might however be a little misleading. The original idea was that this would be a university for students belonging to one of China’s ethnic groups, but in reality, the only minority clearly present is the “Manchu” minority, and the majority of the students is Chinese. For my research this is nice, but the name implies something different. This first blog is merely an introduction to the blogs I will write in the coming five months. Now you all know who the Manchus are and where I am at the moment. I promise you that the next blog will be a whole lot more fun to read than this history and anthropology lecture. 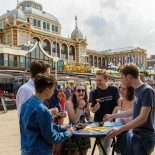 This entry was posted on October 30, 2018 by admin@theleidener in Guest Blogger, Practical Stuff, Student Life, Study, Study Abroad Semester, Travel, Uncategorized and tagged Asian Studies, Hebei Normal University for Nationalities, research.